Herbicide-resistant weeds are becoming increasingly common in agricultural landscapes. Existing methods for confirming herbicide resistance require knowledge of the genes responsible for target-site resistance, but this information is not always known. 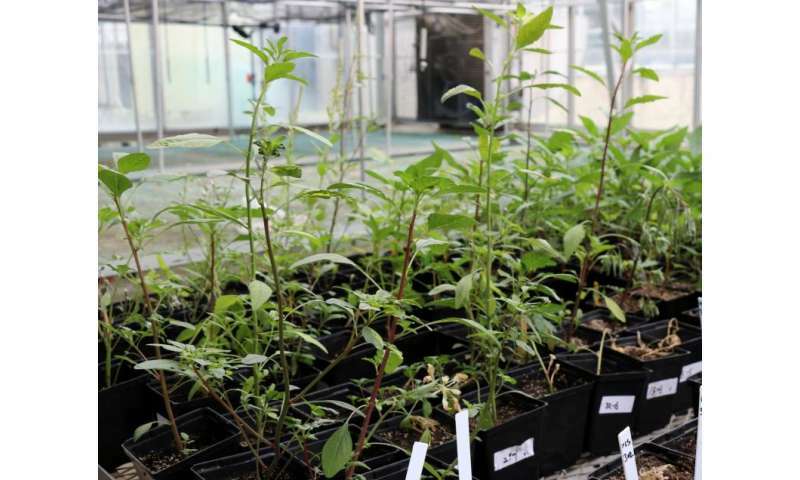 A new method, developed by University of Illinois researchers for waterhemp, can test for herbicide resistance without prior knowledge of the genes involved. Ask any farmer, and you'll hear that weeds are a major headache. Even worse are weeds that have developed resistance to the herbicides designed to kill them. This is the case for waterhemp, a broadleaf weed commonly found in corn and soybean fields. Many populations of waterhemp and its aggressive cousin, Palmer amaranth, have become resistant to atrazine, mesotrione, and a number of other commonly used herbicides, sometimes leading to significant yield losses in corn and soy crops. "If you continue to spray the same herbicide on plants, there is a chance that a very small number of them will survive and reproduce. Some of their offspring will be resistant to the herbicide. By using the same herbicide over generations, we are selecting for weeds that are resistant to that chemical," says University of Illinois postdoctoral researcher Rong Ma. Plants use a variety of mechanisms to avoid the toxic effects of herbicides. The most common mechanism, known as target-site resistance, comes from a gene mutation that keeps the herbicide from attaching to the proteins it is designed to destroy. The presence of these mutations in waterhemp populations can be quickly tested genetically, if the site of the mutation is known in advance. Another mechanism is known as metabolic resistance. In this case, the plant uses common enzymes to detoxify the herbicide before it even reaches the protein it is meant to destroy. "Humans also have these broad, detoxifying enzymes. They can help detoxify drugs or chemicals we consume," Rong explains. The enzymes responsible for metabolic resistance aren't always known, although they generally fall into one or two broad classes, P450s or GSTs. "The problem is that plants have hundreds of these P450s or GSTs and we haven't yet identified which are responsible for resistance to the particular herbicide," says U of I weed scientist Dean Riechers. Since the genes for those enzymes are usually unknown, it is not possible to test for them using the traditional genetic methods. Ma, along with a team of researchers at U of I led by Riechers, have developed a new technique that can accurately test for metabolic resistance without relying on knowledge of the specific gene(s) involved. The new method involves exposing a single small leaf blade to a radioactively labeled herbicide and then determining how much of the herbicide is left after the leaf has a chance to metabolize it. The less herbicide remaining over time, the more resistant the plant is. The study tested three populations of waterhemp and two herbicides, mesotrione (Callisto, an HPPD inhibitor) and primisulfuron-methyl (Beacon, an ALS inhibitor). Although different populations appeared to detoxify the two chemicals using different biochemical mechanisms, the new method worked for both. "The method should work for additional herbicides and even different weeds or crops," Riechers says. "We tested a third herbicide using the method with excised soybean leaves, and it worked. And as long as the leaf or petiole can fit in the tube, it should work for almost any plant." Although the new method does not pinpoint the exact genes responsible for enhanced herbicide metabolism in resistant populations, it does indicate the general class of genes and the mechanism involved. The next step for the research team is to identify specific genes and eventually develop markers for rapid testing using conventional genetic methods. Riechers says that other universities and companies are already using the new technique. The article, "Measuring rates of herbicide metabolism in dicot weeds with an excised leaf assay," is published in the Journal of Visualized Experiments. Joshua Skelton, also from U of I, was a co-author on the article with Ma and Riechers. Funding was provided by Syngenta Crop Protection.